Steel and the steel industry are the backbone of Chicago's southeast side, an often overlooked neighborhood with a rich ethnic heritage. Bolstered by the prosperous steel industry, the community attracted numerous, strong-willed people with a desire to work from distinct cultural backgrounds. In recent years, the vitality of the steel industry has diminished. Chicago's Southeast Side displays many rare and interesting pictures that capture the spirit of the community when the steel industry was a vibrant force. Although annexed in 1889 by the city of Chicago, the community has maintained its own identity through the years. In an attempt to remain connected to their homelands, many immigrants established businesses, churches, and organizations to ease their transition to a new and unfamiliar land. 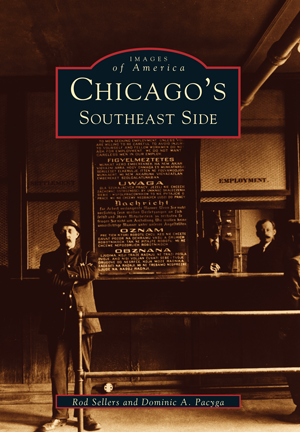 The southeast side had its own schools, shopping districts, and factories. As a result, it became a prosperous, yet separate, enclave within the city of Chicago. The story of this diverse, working-class neighborhood is beautifully compiled by authors Rod Sellers and Dominic A. Pacyga. Together they have written an informative history that combines intriguing photographs and the local history of a community that has always believed in the American dream. Those who remember the heyday of the neighborhood will treasure Chicago's Southeast Side for many years to come.